So far there has been 196 responses in my Personal Learning Network (PLN) Survey since it was created in October. And I know a lot of people are interested in what it all means and how I am using this information so let me explain. Ability to receive and give advice in our normal f2f interactions is mostly limited. Personal learning networks greatly enhance our ability to get assistance, increase our learning, reflection and innovation. Originally I asked my network to help me by sharing their advice by responding in the form of comments on a blog post. While it worked extremely well analysing the information was hard due to the number of comments. This is when I decided that an online survey was the better option. What’s the most important thing you’ve learned from your PLN? What 5 tools would you recommend as a starting point for building a PLN? What are your 5 tips for new people to help them get started building their PLN? The main design flaw in the survey is Question 1 where respondents were asked to rank 10 types of tools in level of importance in their own PLN. I decided to use ranking of tools that I provided rather than allow respondents to name their top 10 tools because I felt it was more likely they would miss an important tool and it would also make responses harder to analyse. While the concept of ranking was a good idea unfortunately I missed two important tools – wikis and virtual worlds such as Second Life. It also meant by supplying the tools to rank potentially I was biasing what options people choose. Also it would have been good if the survey design provided greater flexibility for respondents to replace the supplied choices with their own options. Other challenges were with 196 responses analysing short answer questions such as your 5 tips and most important thing learnt from your PLN became harder to analyse. Due to the number of response it was necessary for me to pay to use Survey Monkey which was great in terms of the fact I was able to download and analyze the responses using Excel. If you would like a copy of the raw data please leave a comment and send to you. 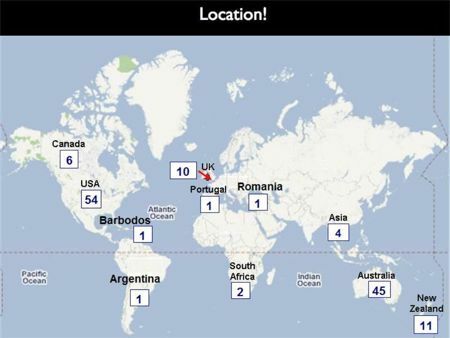 Most of the people who responded where from USA, Australia, New Zealand, United Kingdom and Canada. For Question 1 about ranking the importance of tools in your PLN I used a weighted formula to determine the relative importance of each tool. The following diagram shows the importance of each tool in their PLN with size indicating relative importance. 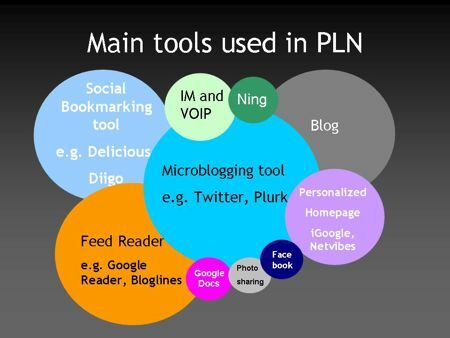 Based on these results microblogging tools was the most important tool in a PLN. Would be interesting to know if how the survey was promoted (i.e. via blog posts and twitter) influenced this result. Please note the order above doesn’t indicate order of priority as respondents weren’t asked to rank. I used the survey results for form the structure of my presentation and I have created a PLN Yourself site to help new people work through setting up their own Personal Learning network. Hopefully people will find my new PLN Yourself site useful. All feedback welcome as to any changes required. One concern I now have is while thePLN Yourself site site explains how to work through setting up your PLN based on the top 5 recommended tools I think it is lacking in terms of top 5 handy tools. Why handy? Well there are some tools that are everyday tools that are important to us all that aren’t necessarily as important for building a PLN. Have I missed anything important? Is the information too hard? What about including top 5 Handy tools? Will it overwhelm? And if I did have Top 5 Handy tools what would your 5 choices be? Let me know if you would like a copy of the survey results. My Edublogs Award Nominations for 2008! Good post. I have started a wiki for people to post links to sites that list “top tools” – if you are interested send me your email & I’ll add you as an editor. Hi Sue – to follow up with my tweet – i think something about tools for writing blogs would be good – for instance i use MarsEdit to update my LJ, Blogger, Edublogs & some others. I get to preview before i post & tag/categorise before i post as well! @Jenni Happy to add my links to your wiki. I’ve sent you an email. You are now at ECU? How is it going? @Jo Thanks for the suggestion. Haven’t tried MarsEdit. Can you tell me more about it? Next time you should just use Google Forms. I found a useful screen cast over at the Cool Cat Teacher Blog. Very useful! Hi Bryan – I did consider using Google Forms but decided that Survey Monkey may be the better option. Definitely being able to easily share the results with Google Forms is a good option. What I would really like to change the survey so that it is less bias. This is a great post that I keep returning to Sue. I’ve just linked it from a blog post about Twitter that I’ve been struggling to complete! It’s interesting what you say about bias in survey design. I think it’s very difficult to design a voluntary survey like this and not have elements of bias, because you are going to end up with people who are interested in the idea of a PLN completing it. I have been trying to gather some data on how people use Twitter and wondered how to ask the question to encompass the variety of uses – I’m not sure about my survey design either. But I guess the key thing is to say it represents a self-selected group rather than a ‘sample’! Hi Leo, glad to hear re-post. I definitely biased the survey. If I had used it with a small number of people first I would have spotted the flaws sooner. Probably the biggest flaw is failure to include wikis on the first page of the survey By missing it people didn’t even consider it. For my survey high response by twitterers would have impacted but not sure that is a bad thing. Yes I see what you mean. I can understand not thinking of wikis as a PLN tool (although of course they are) because I tend to produce them as an ‘output’ and I think of PLN tools as ‘inputs’. If that makes any sense at all. Yes Leo I totally get what you mean. I see tools are those that help create your PLN and those that help manage your workload. Some fall in both categories whereas others fit better with one more than the other. For me wikis are important for managing work and as you say that output. Yet if you look at my PLN yourself wiki people are regularly asking to be added to it. I have 52 people now who have joined it. I assume it is that they either feel they can’t share that information with others unless they are members or they want an easy way to always locate it? Not sure? Does that make it a PLN tool — perhaps? I can send them messages etc. I simply located your website, I actually bookmarked it and i am reading the posts. I witout a doubt really like it. Fascinating subject matter in any case an individual look at this. I come because of this point of view that will notice reviews as akin of attentive. There are also electronic dictionaries for medicines are available as downloadable software. That is why it is more important that you know its symptoms in order to prevent it as long as it is still early. I’m attempting to add your site’s Rss to my own feed reader but it’s certainly not working effectively, you could need to check it out to make sure its operating appropriately.